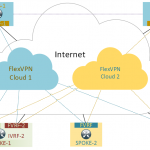 In this post we’ll have a look at the process of configuring a FlexVPN network (unofficially known as DMVPN phase 4). I’ll show what components are involved in configuration and how they all tie together. For most patient readers there’s a bonus at the end of this post. This post will cover several most common QoS configuration techniques for Multipoint VPNs. Focus will be on FlexVPN DMVPN, however most of the conclusions will be applicable to the traditional DMVPN as well.